Yes, there is a Part II. For Part I, click here. Here are the rest of the DVD movies I acquired in a recent trip to China. Even though I didn’t know what it was about, I really wanted to watch this one when it came out at the cinemas, but I’m glad now that I caught it on DVD instead. 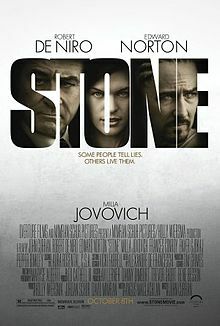 I thought it was going to be a smart, slick thriller, but Stone is essentially a character-driven drama about sexual politics featuring three sensational actors: Edward Norton, Robert De Niro and Milla Jovovich. It’s a stylish film, an interesting film in many respects, but not exactly what I was expecting or hoping for. It seems like the world still isn’t ready for a rom-com about a homosexual couple, because I had never heard of I Love You, Phillip Morris despite the fact that it features two big stars in Jim Carrey and Ewan McGregor. To be fair, apart from the intentionally full on gay jokes, Phillip Morris is not all that different from some of the other slightly farcical, somewhat strange/awkward (The Cable Guy comes to mind) comedies out there. I did find certain parts quite funny, but there wasn’t anything apart from the unusual premise that made this film stand out. And it did get a little tedious towards the end. I’ve loved the story since I was a kid, and so I was kind of excited about the Jack Black version, even though to me Black is a bit of a hit and miss comedian. Unfortunately, Gulliver’s Travels was pretty much all miss. It had a great cast, including Jason Segel, Emily Blunt, Amanda Peet and Billy Connolly, but the jokes were mostly infantile and unfunny. A fair attempt at a modern retelling with updated pop culture references but even as a children’s film it missed the mark. If this film made it to the cinemas then it must have been pulled off pretty quickly, because even though I saw ‘coming soon’ posters months ago, I don’t ever recall seeing the film screening at cinemas. After watching it, I can kind of understand why this film was a flop (or went straight to DVD). On the other hand, there are far worse films making it to the cinemas. 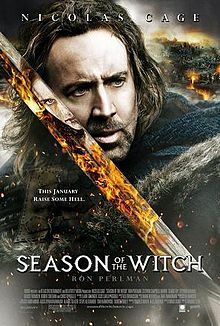 This was a Middle-Ages fantasy film (which I usually like) with Nicholas Cage and Ron Perlman as two warriors tasked with escorting a suspected witch to a monastery. It started off okay but the middle section was a bit of a bore and the final part, as usual, fell apart. A shame, because as uninspiring as it was, I thought there was some potential. And yes, there will be a Part III, though I haven’t watched them yet.